I'm going to try something new. I'm going to start posting initial reviews and the reasons why I return shoes just to get my thoughts out there. I try a large number of shoes on out of curiosity and hope that they will live up to the hype that companies put behind them. I also win a good number of races that offer free shoes as the top prize, so additionally I try shoes on trying to pick that one. Most of the time I end up taking the first one back because I am both curious and picky even after 1-2 hours in the store. Additionally I try on and end up returning most of the shoes I get from Running Warehouse (yes... I have taken thorough advantage of their free shipping and return policy. I never take the shoes out on the road though and keep the testing to the carpet and my apartment hallway only). So instead of just returning them without reason, I'm going to post my thoughts about them. Maybe something I don't like someone else will and they'll try the shoe. Or maybe this will serve as a warning and stop someone else who shares my feelings from wasting their time. Or maybe I'm just looking for a reason for more posts. On deck first for this round of Initial Review and Return we have the Asics DS Racer 10. Intro: I really wanted to like this shoe. I've been having some stability needs recently due to a neglect of my Peroneus Longus and Posterior Tibialis muscles. These two muscles are very important in maintaining arch strength and should be kept strong. I pronate heavily and tweaked my left Peroneus Longus muscle a few weeks ago running in a great but unstable and very neutral shoe while neglecting my foot strengthening routine. Long story short I'm back trying in stability shoes until I get this under control. I thought the Asics DS Racer 10 would be perfect for my racing needs having some medial posting and weighing only 6.4 ounces. It is currently the lightest stability racing shoe on the market right now with the next lightest being the Fastwitch 6 (Review). I'd hope the combination of mild medial posting and an 8mm drop would take some load off my mildly irritated PL and give me a fast responsive shoe for racing while I strengthened my ankles. The result was not what I'd hoped for. Sole/Ride: The sole had major potential. The initial feel was actually really good! I liked the springy feel of the sole and the duromax support was present but unobtrusive on my foot. The 8mm drop felt perfect (actually felt more like 6-7 because of heel compression.... not that 1-2mm matters). When I ran a few steps though, I immediately noticed how jarring the transition of the shoe was. Heel strikers beware, this shoe does not transition well. I actually noticed this when I tried the Asics DS Trainer 19 as well. Asics just doesn't have the nice rounded heels like Adidas, Brooks, Saucony, etc. Initial contact is fairly jarring and I don't like that. Now maybe that breaks in with use and the shoe becomes more smooth with some wear, but I don't want to be out $110 to find out. Another issue I had with the sole is that the supposedly durable Asics High Abrasion Rubber (AHAR) seemed to be wearing out a bit even with a bit of jogging on the carpet and back and forth down the hallways of my apartment building! 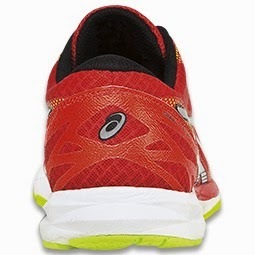 Now I realize racing flats are expensive due to the work to get them so lightweight, but this isn't a sub 4 ounce shoe. I usually get ~200 miles about of Brooks T7 Racers (Review) which are very similar to these in regards to weight. My initial experiences with the Asics DS Racer 10 is that they would not make it that long. Now I could be totally wrong, but that is what my gut, mind and legs are telling me. Upper/Fit: Another set of major problems. The upper is extremely stiff, it tapers way to fast on the lateral forefoot and bunches badly over the toes. The toe bunching would normally go away with breaking in the shoe, but based on how stiff the upper is I have my doubts. The taper issue however, will probably not go away. 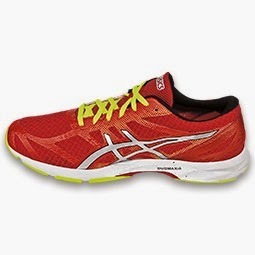 The lateral forefoot tapers really fast and hits my 4th toe in such a way that I am thoroughly afraid of losing a toenail and a lot of blood attempting a 4-8 mile tempo run or any kind of decent length workout (maybe that's why the shoe is red?). Additionally, the achilles tab does not have the nice split that most shoes have and digs into the back of my achilles tendon. This is a bit nitpicky since I have been racing quite a bit in the Adidas Takumi Sen 2 (Review soon) which has something similar but does not come up quite as high. The Takumi Sen 2 achilles tab did not bother me initially and never has. Not sure what would happen with the DS Racer 10. Reason for Return: As I mentioned, the ride was not smooth, the upper didn't fit well and was really stiff and durability do not look like it would be good. Not something I would expect from a $110 shoe. 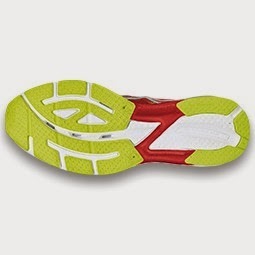 I applaud Asics for getting a stability racing flat down to 6.4 ounces, but they need to smooth out the ride and upper. If that happens then they will have a winner. For now though I'm going to pass. I'm not trying to scare you away from this shoe. I highly suggest you try it on if it does fit your foot and you do like the ride. The Asics DS Racer 10 is the lightest shoe with stability and if that's you need you might as well try it on! Disclaimer: These shoes were a personal purchase from Running Warehouse and were returned. I only ran on the carpet and the hallways of my apartment to keep the shoes in good enough condition to be returned. My thoughts are based on 4 years working in running specialty stores and experience with more shoes than I can count. If I ever receive the shoes for free I will put them through their full paces, but as a graduate student with little money I have to be careful with my shoe purchases. Thank you for reading. 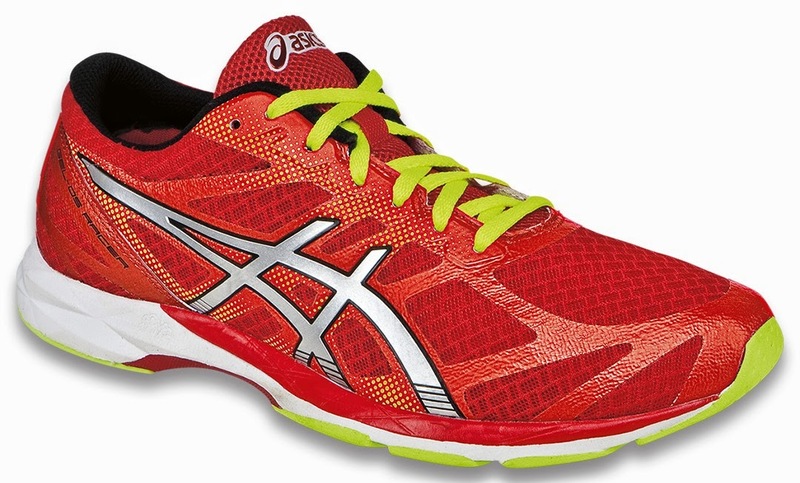 *Images obtained from the Asics America website.